“With another Republican debate comes another Carly Fiorina fact-checking field day. The Republican presidential candidate appears to have no shame in sternly proclaiming verifiably false statements on national television, and last night it was her pants-on-fire claim that “92 percent of the jobs lost during Barack Obama’s first term belonged to women.” This statement has been widely debunked, and is actually nothing more than a rehashed talking point from Mitt Romney’s 2012 campaign. Serving as the Republicans’ attack dog against Hillary Clinton, Fiorina launched into a tirade against the former secretary of state. “It is the height of hypocrisy for Mrs. Clinton to talk about being the first woman president when every single policy she espouses and every single policy of President Obama has been demonstratively bad for women.” First, Fiorina seems to forget that President Obama is not in fact running for president. She then proceeds to give the statistic about job loss. PolitiFact reports that this statement is nothing more than an ancient myth that dates back to Mitt Romney’s presidential campaign. At the time, they rated the claim “Mostly False,” because although it had some numerical validity, the figures were entirely biased. “A big problem with the claim in 2012 was that it cherry-picked the starting date for assessing Obama’s jobs track record. The recession began in December 2007, and he didn’t take office until January 2009, when it was nearly over.” In other words, you can’t blame Obama for inheriting the financial problems that the Bush administration created. What’s more important is to look at what happened to the economy after Obama was elected. As PolitiFact reports, between 2009 and 2013, the economy saw an increase of over 400,000 working women, while total employment rose by 1.3 million. “So more women actually were working at the end of Obama’s first term compared with the day he first took office.” Of course, the Republicans will continue to ignore such facts and blame Obama for all the world’s evils. 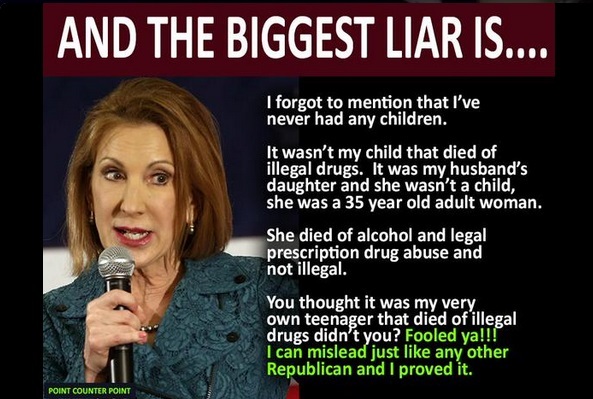 Although she’s not the only Republican candidate who does so, Fiorina is now notorious for disregarding the facts. Her incendiary comments about Planned Parenthood in a previous debate were thoroughly disproven. And while she boasts of her business expertise, she has been named on several “worst CEO” lists. In addition to spouting falsehoods, Fiorina made a number of outrageous claims last night, suggesting that the federal minimum wage is unconstitutional. Such shameless deception truly damages the electoral process. Even if her statements are debunked by every fact-checker on the internet, they still promote misinformation. In this case, not only did Fiorina recycle a discredited talking point from the previous election, she attempted to blame Hillary for the invented statistic about Obama’s presidency. Of course, that didn’t stop Fox News from repeating the erroneous claim the day after it was made.